Hard to believe this is the guy who wrote all those Batman comics in the '80s and '90s. Quick thinking! Helpless against the mighty T-rex, Grant heroically tries to divert the dinosaur's rage from the terrified kids. Now that he's got the big girl's attention, what does he do with her? Dr. Alan Grant is the "hero" of the first Jurassic Park, if such a thing can be said about a movie that has at least three main characters and really stars a bunch of dinosaurs more than any of them. He's one of two POV characters (Ian Malcolm doesn't count, because we don't get to see him be invited to the island), and we spend most of the time following him and the two children he's managed to adopt responsibility for. He famously doesn't like kids very much in the movie, but in the book, he's actually a big fan; he thinks it's endearing the way they're fascinated by dinosaurs. But a Spielberg movie just isn't a Spielberg movie without some daddy issues. 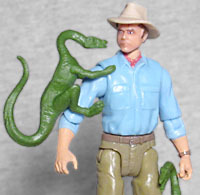 Alan Grant was based on real-life paleontologist Jack Horner (a guy who definitely doesn't hate kids), and is described in the script as "mid-thirties, a ragged-looking guy with intense concentration you wouldn't want to get in the way of." 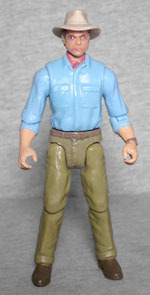 He's played by Sam Neill, and the toy has a decent (but not outstanding) likeness of him, with a slightly grumpy frown and his trademark fedora. The hat isn't just some kind of Indiana Jones affectation, it's an actual thing paleontologists wear: a lot of their work is done in exposed, sunny locations (because there's not a lot of erosion happening under a heavy canopy of foliage), so it's either hat or sunburn. He's wearing a light blue shirt with the sleeves rolled up to his elbows, a pair of tan trousers, and a red neckerchief. The sculpt is good for a 3¾" toy, with the pockets on his shirt and pants, lots of broad wrinkles, and a watch around his left wrist. His articulation is better than expected for this line, but not as good as it could be. Grant has a balljointed head, a swivel waist, then swivel/hinge joints in the shoulders, elbows, hips and knees. My figure has a reversed right arm, which messes with the elbow, but the real problem is that without any kind of ankle joints, there's really no benefit to all the motion in the legs. We're not demanding "GI Joe G3"-levels of articulation (though that would be a lot more fun), but some ankles and wrists would go a long way to improving the toy. 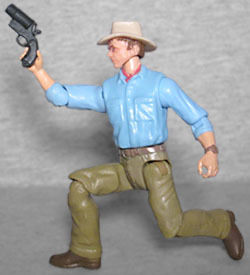 The figure's accessory is a flare gun, which seems to be a reference to Jurassic Park III rather than the original movie - yes, he used a flare there, but that one was handheld. The scale of the accessory seems to confirm what we said in the Muldoon review about the gun being oversized: this thing is sized more for a 6" figure than a 3¾" one. Like all three figures in this Legacy Collection subline, he comes with a little green compy that can grip a limb and chew on his flesh. Surprisingly, it's a unique mold, not the same one we saw last time! 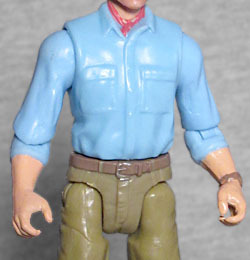 Kenner made some Alan Grant figures back in the '90s when they had the Jurassic Park license, but none of them looked or played as good as this one.